This is the Sather Tower, the best known landmark of UC Berkeley…probably the most recognizable building in all of Berkeley. It is one of the few landmarks in the East Bay you can recognize from most vistas in San Francisco. 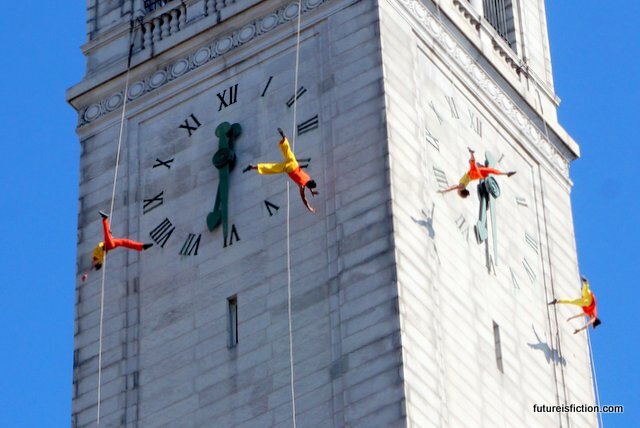 Today the Sather Clock Tower (also known as the Campanile) turned 100. 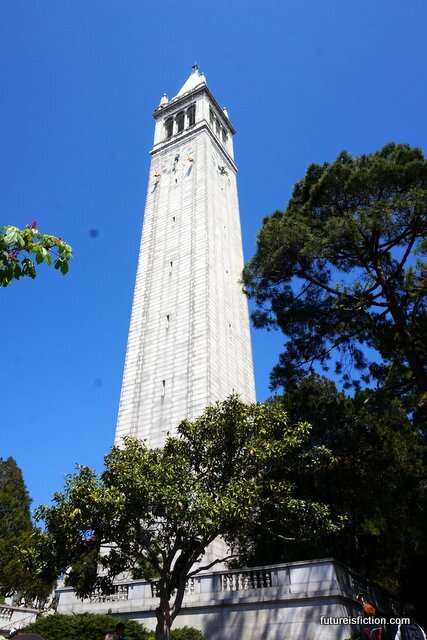 The Berkeley Clock Tower is the third tallest tower in the world (correction: third tallest university clock tower). Did you notice the tiny yellow and orange dots at the top there? Those are people. Let’s get a little closer. They’re acrobats. 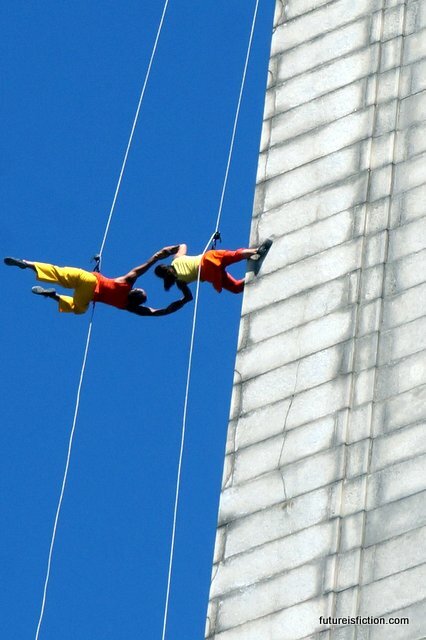 BANDALOOP do vertical dances hanging from the sides of buildings. 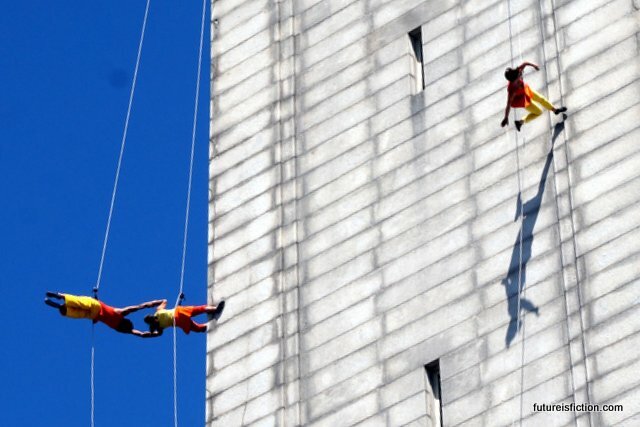 Today they performed to celebrate the 100-year anniversary of the Campanile. They started on the hour, so the dance was preceded by the sounds of the grand carillon of bells from the clock tower. It was a beautiful day, typical of the Bay Area. Hot and bright enough to burn you in the sun, surprisingly chilly inches away in the shade. We sat in the sun. It was a solemn dance to music slow enough that the dancers seemed to flow. Like kites. 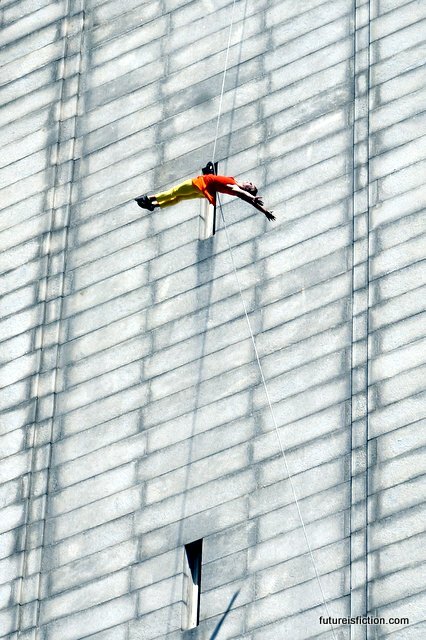 When they repel off the building, I wonder how hard they land. When they touched brick, sometimes they’d steady themselves, as if from a jolt. But only for a second, and they they’d leap off again, full of grace. 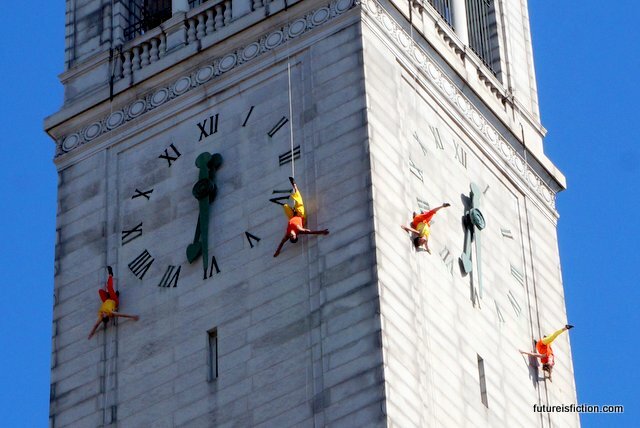 As BANDALOOP danced they’d gradually lower down their ropes, the song ending as they reached the bottom. 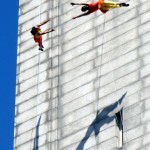 I imagine they must choose music and choreography, in part, based on the height of the tower they are performing on. 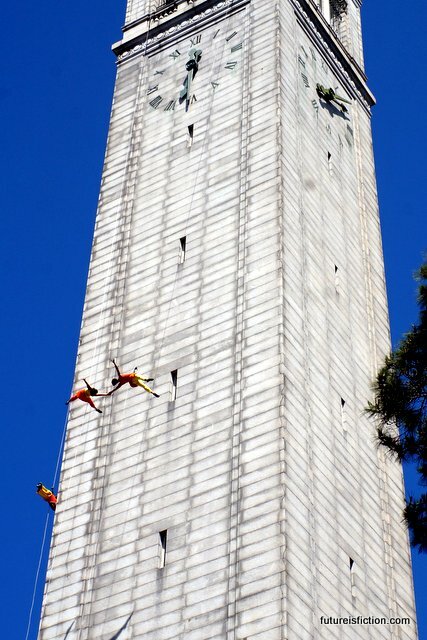 The Berkeley clock tower is not empty. It is filled with fossils. You think I’m writing some kind of poem here, but no. I mean this literally. There are 300,000 pieces on five levels within the tower. Hauled out of the La Brea tar pits, the fossils have been at the Campanile since 1913. Maybe that’s not relevant to this story. Or maybe it means something that they do their perilous dance over a building filled with death. They also did a jaunty swing number. The big band music piped through the speakers was impressively balanced: full, but not too loud. The fast pace was a nice contrast from the other song. Just like swing dancers. In fact, looking at these pictures, it’s easy to forget they’re not only dancing. 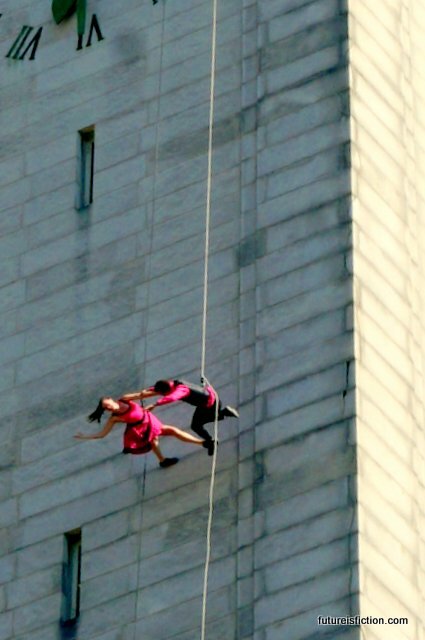 But for the rope, it’s easy to think perhaps we’re looking down on ordinary dancers from above. Did you know Carillonists play the clock tower bells with their feet as well as with their hands? It’s true. Just one more photo of the aerial show. Maybe this is off topic (again), but this morning I read a news story that declared the three worst places for renters are in the Bay Area. Oddly, instead of thinking, “gee, I should move,” I thought, “I hope other people see this and decide to move so the price of rent will go down.” I’m hooked on this place. Maybe it’s not pertinent. But I see something like this, on a perfect day like today, and it feels all kinds of relevant.